A Successor Emerges From The Fallen Outworld. The truism of the candle that burns twice as bright tends to also burn half as long is a pretty bitter sweet pill to swallow, but yet an all too necessary one when it comes to a number of consequential metal bands that tried their hand at resurrecting the genre on the western side of the Atlantic. Perhaps the most blatant example of a band achieving greatness to the result of limited fanfare and followed by a quick demise was the progressive metal colossus Outworld, which all but conquered the world musically and set a new standard for the sub-genre by which a number of future bands outside the U.S. could be measured with their eponymous debut, and quickly self-destructed soon after with only a few additional songs recorded with a few notable lineup changes. Since then, it had been stipulated that there would be some coattails among the alumni of said band after being scattered to the four winds, but apart from a one-off recording with the progressive project Eumeria in 2011 featuring keyboardist Bobby Williamson, not much came of it for more than a decade. However, as far back as the early aftermath of Outworld’s demise, a small time project was in the works that would later enlist the talents of said band’s last lead vocalist Carlos Zuma, following a smattering of guest vocal slots with projects such as Empires Of Eden and Soulspell. 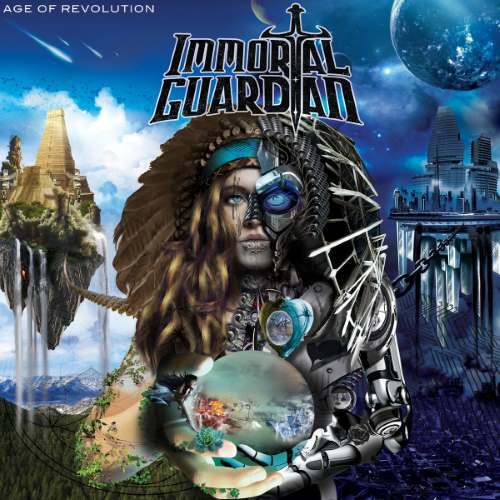 This band goes by the name Immortal Guardian, and from their heat-drenched locale in San Antonio (later Austin), Texas they set about distilling the most intense elements of power and progressive metal into a mechanized beast of sound that they like to refer to as “super metal”. Enlisting the bass talents of Ethereal Architect virtuoso Thad Stevens and being comprised of co-founding members Cody Gilliland and multi-instrumentalist and principle songwriter Gabriel Guardiola, this band carries all of the necessary chops to not only emulate the otherworldly take on high-stakes progressive metal that Outworld initially pioneered, but also take it into a wildly different direction that results in a veritable vortex of technical intrigue that manages to culminate in a collection of songs in Age Of Revolution that are highly catchy and widely accessible. Unfolding in a quasi-storybook fashion, this album opts to begin things with a sorrowful, piano driven opening prelude that ends up recurring in a sort of reprise fashion at the album’s close, and the various songs contained within showcase a heavy degree of stylistic and thematic unity befitting a concept album, though lyrically these songs do not conform to such a model. Playing off an unrelenting onslaught of rhythmic shifts, wild lead fills from the guitars and bass, and a schizophrenic yet methodical man-of-a-thousand-voices approach to clean and harsh vocal performance out of Zuma that would put Stu Block to shame, this music is nothing else if not progressive in its presentation. Yet at the same time, when encountering the ultra-infectious character of a number of riveting anthems such as “Never To Return”, the political charged “Hunters” and the Scar Symmetry-like extravaganza “Zephon”, these prove to be the sort of songs that one could catch himself humming after the album has ended, irrespective of all the moving parts that include random jazz, Latin, and classical music genre-shifts that enter the fray in the most jarring of fashions. Sadly given the still largely underground status that metal presently enjoys, particularly when it comes to stylistically trailblazing affairs like this astounding debut offering, there won’t be any massive awards ceremonies to recount the accomplishments of bands like this one to the roaring fanfare of the masses. But hypothetically speaking, if such an event were to occur, the author of this review would instantly move to nominate Immortal Guardian for best new artist and also given a hearty endorsement of this album being in the running for best LP of 2018, along with an easy win for power/prog album for this year. There are no dull moments to speak of at any point of this ironically short and compact offering, and if there is any flaw to be found in it, it is that it is so radically ambitious and compressed with so many good ideas that accusations of sheer overkill could be thrown its way. The pain that the progressive metal world has felt since the day that Outworld folded tent and the generally inability of most of its former members to recreate said magic may be great, but for those feeling it, this will ease the pain, not to mention usher in new members to the guitar, bass, drum and vocal god pantheons between the wild individual talents displayed by each person in this fold. This entry was posted in Featured Review, Power Metal, Progressive Metal, Reviews and tagged Age Of Revolution, Austin, Empires Of Eden, Immortal Guardian, Outworld, power metal, progressive metal, soulspell, Texas, U.S.A.